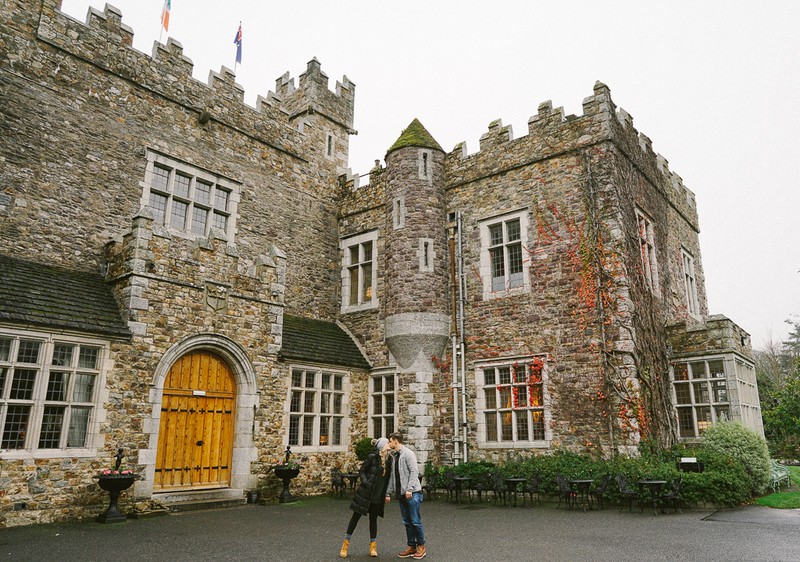 From Dublin, Ruth and I spent two days at the most magical castle hotel in Ireland on our recent trip, and it was, without a doubt, one of the highlights. Ireland is by no means a small country, with tons of areas to explore. We can’t wait to go back to see more of the countryside, but we couldn’t have found a better spot for our inaugural trip. As I researched, it became immediately clear that we needed to make a stop at one of the many historic castles that conveniently double as resort hotels. Thankfully, it didn’t take much convincing to get Ruth on board. That’s what we call a win-win, team. Waterford is a seaport town a few hours south of Dublin and is the oldest city in Ireland. Despite all the Viking history, the gem of Waterford is the castle located a few miles outside the city center. The Waterford Castle Hotel & Golf Resort sits on beautiful little island on the River Suir. It really wouldn’t be a proper castle without an operating moat now would it? Well, sort of. Visitors take a ferry across the 200-foot-long channel to the island. A staff member told us that the owners never installed a bridge to keep it more exclusive. Boy, did it feel that way. We spent two nights at the Waterford Castle, and it felt like a dream. Ruth wouldn’t stop throwing around the world “fairytale,” and I think I even heard her refer to herself as a “princess” once or twice. The property, covered in lush greenery and wildlife, provides guests with a peaceful escape. In fact, we didn’t leave the property once during our stay. This stay was much different from our typical travel, where we are moving 100 miles per hour to see everything we can. At the castle, there was plenty to do, see, and eat, making it the perfect castle hotel in Ireland. The staff is incredibly welcoming and made sure that we felt perfectly at home (we did). The first afternoon we got in, I bit the bullet and agreed to afternoon tea. You have to realize I was initially not super interested in afternoon tea. I had a long to-do list, including golf, clay pigeon shooting, and falconry–all offered at the castle. Ruth, however, really wanted to have tea, and who am I to say no to a snack? (Learn more about how we’ve mastered the art of the compromise here, haha). But, to be quite honest, I rocked afternoon tea. Picture a tiered setting of snacks and pastries, with a nice hot tea (or coffee–they do that!). I mean, it is an EVENT. Needless to say, I’m a fan, and we got afternoon tea again in London. The Waterford Castle also houses a Michelin-starred restaurant. Ruth and I have an ongoing list of our top ten most memorable dining experiences (referenced on our recent trip to Vermont). Within the first ninety seconds of sitting down at the Munster Room Restaurant, we knew it was easily going to crack the top ten. By the end of the meal, there was no question. Our next day at the resort was basically a dream come true for me. We spent the day exploring the property and taking advantage of all that the resort has to offer. After a late breakfast, we went clay pigeon shooting, and this was such a fun experience. I could not have been more thrilled to be shooting guns a castle hotel in Ireland. Every guy’s dream, right? In the afternoon, we hit a bucket of golf balls at the driving range. We unfortunately didn’t play a round of golf because it had rained overnight, and I did not come prepared to play in the conditions. Nevertheless, we hit two of my favorite activities all while enjoying the beauty of the property. This was one of our most relaxed stays ever. After hitting golf balls, what do you do? Head to the bar in the castle, of course. We ordered the best coffee and Baileys we’ve ever had, sat back and soaked up the afternoon sun for an hour or two. To end the day, we ordered some carry out pizza (as we do) and watched a movie. Granted, our stay at the Waterford Castle had the itinerary of a very lavish bachelor party (minus the afternoon tea), but I couldn’t have been happier to share it all with Ruth. If you found this guide to the best castle hotel in Ireland helpful or entertaining, we’d love it if you chose to follow along on Instagram. Loved the photos and the dialogue to go with it. Did you purchase any Waterford crystal while you were there? No we did not, but I’m totally regretting it now!